Clogged air filter = A/C issues ! Hopefully we are past the pollen of the season and can rid our vehicles and driveways of any remaining yellow residue of all that is “Spring.” This time of year is an excellent opportunity to do a little Spring Cleaning on your vehicle and take care of those maintenance items you may have put off during the cold winter months. Das Autohaus is here to help you accomplish this task ! Your cabin air filter is one such item that needs attention. It not only cleans the dust, mold and allergens from the air that enters your vehicle, but it is also an extremely important part of your car or truck’s heating and air conditioning system. Do not underestimate these paper filters because they are instrumental in protecting your vehicle’s heat and air system components. 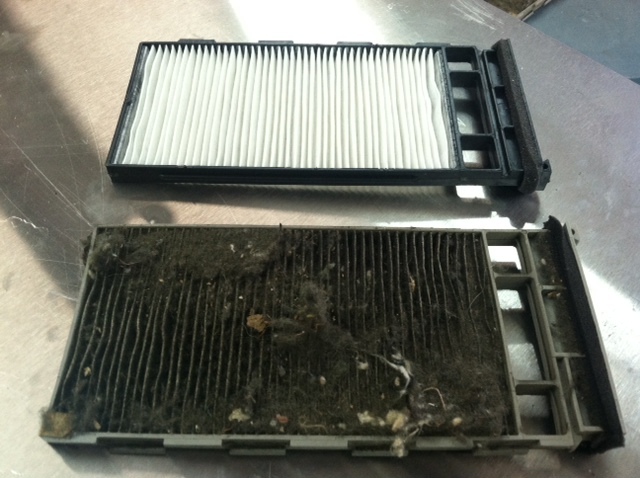 Your vehicle’s cabin air filter is very similar to the HVAC filter in your home. Outside air comes in and is cleaned via filter and delivered to your vehicle or home much cleaner than it went in. Think about how it was many years ago when we did not have filters to clean up the air, and our vehicle seats were covered in dust and pollen from the atmosphere. Thankfully, technology has progressed and provided us with ways to improve the air that comes in contact with our eyes and nose. We have been told many times to change our home’s air filters often to keep our system running efficiently, thereby reducing any unnecessary increase in an electric or gas bill and keeping our air as clean as possible. Likewise, a clogged air filter is extremely inefficient and also restricts air from getting into the cabin of your vehicle. That means the heating and cooling system must work harder, which ultimately leads to premature and often un-timely breakdown of system components. We stress the importance of preventative maintenance on your vehicle – whether you are driving an Audi, Volkswagen or any other type of vehicle. The maintenance items that you overlook can often times prevent more costly repairs in the future. Call Das Autohaus today at 520-8523 to schedule your appointment to keep your vehicle in proper working condition.